Presence technology is an integral part of any unified communications and collaboration strategy within an enterprise or company. Learn how presence works and how it can be used to make employees more productive. Philosophers and mystics have a lot to say about presence. "The most precious gift we can offer each other is our presence," says Vietnamese philosopher Thich Nhat Hanh, who also notes that life can only be found in the present moment. But from an enterprise IT perspective, presence technology isn't exactly mystical -- it's the critical component that enables unified communications, collaboration, and knowledge management technologies to work together to make employees more productive. What is presence and how does it work? What the person is currently doing. Whether the person can be reached. How best to reach the person (phone, instant messaging, email, videoconference, etc.). These sound simple enough. But simplicity can be deceptive. The outside world is far from monolithic. It comprises perfect strangers, customers, family members and personal friends, team members, managers, and fellow employees, each of whom might merit a different response about an employee's status and reachability. Then there's the question of "who the person is" -- which, again, can vary by context. A customer seeking technical support, for example, might not care in the slightest about reaching an employee named Mary Smith -- he just wants to reach someone qualified to fix his particular problem. Use the rest of this tip series to further your knowledge of presence technology. So a better way to define presence is that it's a way of providing the above information in the context of who's requesting it. And with most systems, it's possible to tune or tweak availability and reachability information based on the context of who's requesting it -- so that a family member might be told, "Do not disturb -- having performance review with the Big Boss," but a fellow employee might simply see "unavailable." Technically, the earliest form of presence is the telephone busy signal. Automatic call distributors (ACDs) are another approach to presence (routing callers to the "next available agent"). And a more recent mechanism is instant messaging, which includes basic indicators for availability, including the ability to set "away" messages. Presence tends to be a feature of a tool, rather than a standalone tool itself. Instant messaging, telephony, email, conferencing, and social networking tools all increasingly have presence as a built-in capability. So, from an enterprise perspective, the question isn't really, "Should we deploy presence?" (you probably already are); it's, "Which instantiation of presence should we standardize on and build business processes around?" That is, many organizations are standardizing around the presence component built into their messaging solutions, such as Microsoft's Office Communications Server (OCS) or Lotus Notes' Sametime. 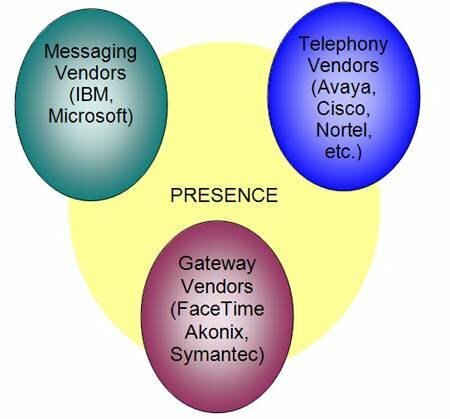 Others rely on a messaging gateway from companies like FaceTime, Akonix and Symantec that federates with public IM services and also layers on features like auditing, logging and management -- known as federated presence. And some are relying on the presence capabilities of their telephony systems, particularly unified communications solutions from vendors like Avaya, Cisco, Nortel, Mitel, Siemens and ShoreTel. Over time, expect these three categories of vendors to increase their integration with one another -- and also with other devices and systems such as mobile phones. Regardless of which approach an enterprise pursues, it's important to keep several issues in mind. First is that, properly managed, presence can be a real boon to productivity. It helps reduce the overhead required to locate individuals and get questions answered. (Often, the ability to get a simple "yes or no" question answered in a hurry can expedite a project by days or even weeks.) So it's wise to think in terms of enabling presence rather than quashing it -- it's not only a legitimate business tool but, properly implemented, a highly effective one. That said, there are important challenges that need to be addressed. For example, presence information (including, but not limited to, instant messaging discussions) is very likely to be discoverable, which means it needs to be archived and/or destroyed as part of a company's overall e-discovery policy. It also needs to be protected -- you don't want competitors to see that the CEO is "in a meeting to decide whether to purchase company X." That means not only employing appropriate security measures but setting and standardizing upon policies regarding how much information is revealed, and under what circumstances. The bottom line? Enterprises interested in exploiting presence need first to decide which system they'll deploy as the cornerstone of their presence initiative. They should address head-on such issues as privacy, policies and e-discovery. But above all, they should embrace presence, not eschew it. As the philosophers say -- presence is precious.